Apowersoft screenshot is a powerful app that you can use to screenshot without rooting your Android devices. It also provides some other functions, including an Internet browser, an image editor and a drawing board. Therefore, you can capture any webpages, images and doodles. The screenshot will be automatically loaded in its image editor which has a lot of useful functions like cropping, annotating, uploading and sharing. Here are the detailed steps of using this app. First of all, download this app from Google Play and install it on your Android device. Open this app, and tap on the “Start” button on its starter interface. If your device is lower than Android 5.0, then, you need to press the “Power” + “Volume button/Home” buttons at the same time for 2 seconds. If your device is running Android 5.0 or higher, then, you can just tap on its blue overlay icon to take a screenshot. After that, the screenshot will be automatically loaded in its image editor. You can crop it or annotate the screenshot with lines, arrows, texts, mosaics, etc. Lastly, tap “Done” > “Save” to keep the screenshot on your device. Alternatively, you can also choose to upload it to free cloud space provided by the developer. Android takes a significant part of the smartphone market. Some of the most well-known brands are Samsung, HTC, LG, Nexus, Huawei, Motorola and ZTE. They have all equipped a default way for taking screenshot except Samsung. To screenshot on Samsung phones, you need to press the “Power + Home” buttons simultaneously. You will see an animation on the screen and hear a camera shutter sound. That means you have taken a screenshot successfully. The screenshot can be found in the Gallery app. To screenshot on other Android phones, just press the “Power + Volume down” buttons at the same time. That is the only difference from the way of taking screenshot on Samsung. The following steps are the same. You can check the screenshot in the “Screenshots” folder under Gallery. Those are the default ways on how to take a screenshot on an android phone. They are simple and easy to perform, just make sure that you press those key combinations at the same time. Tablets are the second common digital product that we own nowadays. They are very convenient to carry around. Popular android tablets are Samsung Galaxy Tab series, Nvidia Shield Tablet, Lenovo Yoga Tablet, Google Nexus 9, etc. To take a screenshot on those Android tablets, just press the “Power” and “Volume down” buttons simultaneously. All the screenshots will be automatically saved to the Gallery app. Attention: On Samsung Galaxy Tab 3, you need to press “Power + Home” keys to take a screenshot and check it in the Gallery app. Those are the default ways on how to screenshot on Android tablets. A majority of android tablets adopt the way of using “Power + Volume down” key combination. If it doesn’t work on yours, try the other way of “Power + Home” key combination. To help you make screenshots regarding different scenarios, here we have included some articles for your specific needs. Therefore you can find ever better solutions accordingly. Multiple Ways to Screenshot Samsung Galaxy S6 and S6 Edge – There are many easy ways on how to take screenshot on Galaxy S6. From using the home button to efficient applications, discover them all on this article. 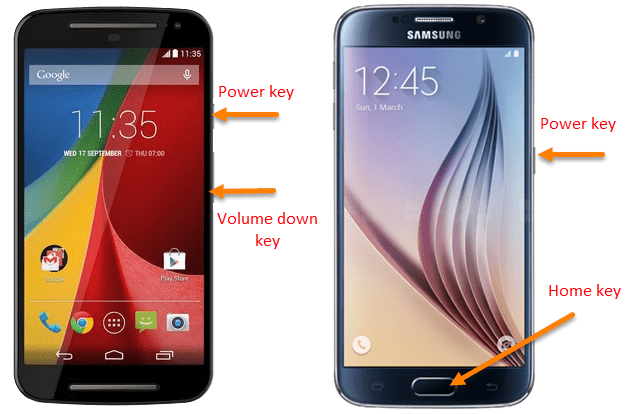 How to Screenshot on Samsung Galaxy S5 – Taking screenshot on Galaxy S5 is quite necessary for those who desire to share others the interesting pics or jokes. To do that, you can learn feasible solutions here. How to Screenshot on LG G3 – Do you want to know how to screenshot on lg g3 or search for a better ways to do it? Then learn the best solutions provided in this article. How to Take a Screenshot on Alcatel One Touch – Taking screenshot on Alcatel One Touch allows you to share great moments with your friends and family? Read this article and learn how to do this trick. Ways to Screenshot Asus Zenfone 2/4/5/6 – Screenshots are the best way to record and share interesting or important stuff on the phone. Read this article to learn how to screenshot asus zenfone 2/4/5/6. How to Screenshot HTC One M9/M8/M7 – This article gives you an overall guide for you to snapshot on HTC One M9/M8/M7. How do you delete the ones that we don't want any more on snapshot.net and also how do you find the snapshot that we took to delete it? Its not working at my huawei! First I have to try this App for few days and I will Rate it. More Power! Druk ze gedurende minstens 2 seconden.